CLAT exam will be your gateway to an intercontinental corporate job, or your way to being the leading lawyer or a judge in the apex court of India so CLAT is important as it smoothens the path for you to a world of avenues each of which is better than the other. This article is a success story of a CLAT aspirant who first cleared CLAT and joined NLU Jodhpur, and subsequently in the next year bolstered up his rank to AIR rank 10 and joined NUJS. He didn't want to join NLSIU for some confidential reasons, and is felicitous about his rank and college. 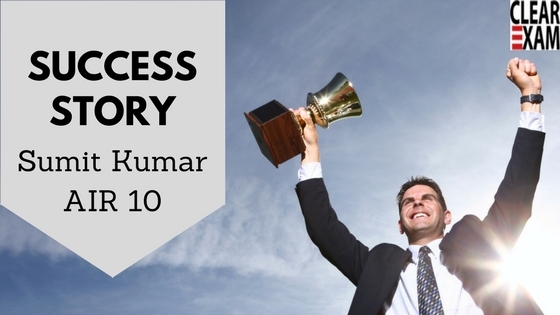 This is a narration of Sumit Kumar Gupta's success in CLAT and him getting a rank 10 in the 2017 CLAT exam. He readiness for the law entrance exam for two years made him get selected each time. Sumit totally believes that there is no secret to success, and it is a result of preparation, hard work and learning from failure. Sumit gives his preparation tips for and about all five CLAT subjects. His thinking is that CLAT is a comprehensive exam which is a mix of rote test, analytical abilities. Let us look at his preparation tips starting with the English section. He says he started with vocabulary and focused on all different sections- vocabulary, grammar, and comprehension. He also says that one should not leave out any aspect or section in the shade. He refers the same books which he studied in Success Mantra coaching classes. One of these books is Word Power Made Easy( the best book) which makes one up to the point in vocabulary. Just like Successmantra coaching classes, Sumit also suggests that one should go through this book once or twice. This book would help you with AILET, and CLAT both according to Sumit. Maintain a notebook for vocabulary says Sumit. On an average write 10 words in the notebook . At the end of the year you would have 2000 - 3000 new words. Reading comprehension can be prepared for by reading the editorial section of Hindu newspaper. This improves your ability to grasp new passages and this also improves your GK. You will be able to analyze the information given properly when prepared. You can pick Indian express, or Times of India as well. Mark important lines from the editorial. It is all connected. You get more words from the Hindu for your vocabulary preparation. Grammar preparation should be upto grade X level. Articles, conjunctions, prepositions are important. Hone your skills by reading books like Wren and Martin, and Objective English by RS Aggarwal. Once again these are the very books which Successmantra coaching classes recommends. Sumit says you should know the rules of English grammar. Enlist these rules. The English score of Sumit was 26 which is pretty good. Generally every candidate has phobia with maths. Let us now know what was sumit's preparation tips for Maths. Maths is upto grade X level i.e. elementary level. Know all basics, and advanced Maths is not required. Formulae should be noted down on a list and go back in your free time and revise them. At the time of exams these formulae would come to you, and you will be able to solve the Maths question. Legal aptitude would need you to know articles from the Constitution. There are around 35 questions in this section. Legal maxims, and foreign words are next. Early morning when you are fresh do write 10 legal maxims, and foreign words and at the end of the year you will know 400 legal maxims. Then comes legal principle based questions. Here sticking to the principle is important. If the principle says that murder is not an offence, then the answer should be that murder is not an offence. Knowing powers and duties of the president and similar questions are important. You should know polity as well. Jot down whatever you find important. This will help you revise when there are only a few days left for the exam. You cannot open books towards the end so you should have hand written notes. GK is next. The trend of CLAT should be known to you. If you do not know the trend then Successmantra coaching classes would do that job for you. Sumit learnt in Successmantra that the trend is such that the focus is on current affairs, and less of static GK as the CLAT organizing body is shunning the static GK. Current affairs from the June month of the previous year till April of the year of the exam will be the focus. Apart from the newspapers do study the headlines of good GK magazines. On a daily basis jot down important news. Then again in the morning when you are fresh do revise your GK basics, or anything which you have otherwise forgotten, and what is otherwise your weak point. Sumit's motivation and quick trick is that morning is the best time to study as you are fresh. Also, being selective in static GK is another one of smart study tip by Sumit. These smart study methods was learnt by Sumit during his time at Success Mantra. Sumit wants to remind you that CLAT is not IIT or IAS level exam so you can skip what hasn't been asked in previous years. Be selective and choose what is relevant. Successmantra states and Sumit agrees that modern history becomes more important than ancient, or medieval history. Geography, and economics basics should be known to you. Know the basic terminology as well and not more. Logical reasoning or analytical reasoning is next. Remember the formulae for clocks, and calendars, and know that you have to solve 200 questions in 120 minutes. Speed for this questions is important. Spend only 30 minutes in this section. Be selective here as well in the sense that know which questions are important and solve quick. RS Aggarwal, or Arihant publications and Successmantra coaching material should be good enough. If you are spending 2 minutes on a question then that is wrong. Basic strategy should be solving a lot of questions, and improving your speed. This is another winning tip by Sumit for which he thanks Successmantra. Solve 100 mocks. Every successful aspirant will tell you this. 2 hours goes to solving the mock, and then 2 hours for analyzing the mock. If you do not know a particular question then solve many questions of the same type. This will make you able to solve a tough question in the exam. Successmantra mocks are quite close to what one can expect in the exam, and the coaching institute helps you try and analyze your weak and strong points. Study for at least 6 hours and maybe upto10 hours is Sumit's suggestion and that is very true as hard work will always pay off. These are seemingly simple tips that have been shared by Sumit and he truly wishes everyone success in the CLAT exam, plus these tips will work for every law entrance exam. This is how Sumit has achieved his goal of becoming a Lawyer. We would advise the applicants to follow the Toppers success Stories for their CLAT Exam preparation. It is not rocket science, it is the evaluation of an Exam. We would love to hear your feedback and suggestions in the comment section. Read his success story as he explains his preparation strategy and shares the preparation mantra with the team of clear Law entrance.